CAID 2018 will be hosted in conjunction with the National Deaf Education Conference. 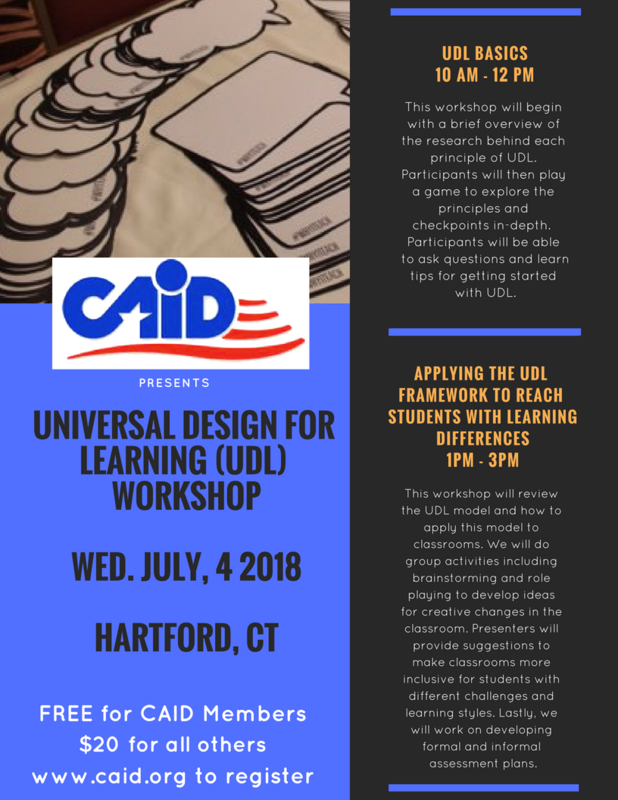 ​We will be leading a pre-conference workshop on Universal Design for Learning (UDL) on Wednesday, July 4, 2018 in Hartford, CT.
Free for CAID members. $20 for all others. This workshop will begin with a brief overview of the research behind each principle of UDL. Participants will then play a game to explore the principles and checkpoints further. Participants will be able to ask questions and learn tips for getting started with UDL. This workshop will review the UDL model and how to apply this model to classrooms. We will do group activities including brainstorming and role playing to develop ideas for creative changes in the classroom. Presenters will provide suggestions to make classrooms more inclusive for students with different challenges and learning styles. Lastly, we will work on developing formal and informal assessment plans. See our past conferences here.